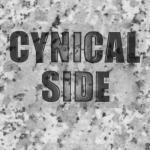 Sign up for Broadjam today to follow Cynical Side, and be notified when they upload new stuff or update their news! Is you mindset? Is it? Get your mind set! Is your mind set? Get your mind set! What do you see? Is your mind set? Get your mind set! Is your mindset? Do you believe it? First you breath. Then you need. Start heading to, what you conceive. If you believe in, what you're seeing, then start heading to and make it be and get your mind set. Get your Mindset! Is your Mindset! What do you see? Get your mindset. Is your Mindset?Get your Mindset! Do you believe it? No time to sleep. No time to eat. Because if you do, you'll get no piece. It's straight ahead. Going at full steam. You've paid your dues. Now chase your dream and get your mind set. Is your mind set? Get your mind set! What do you see? Is your mind set? Get your mind set! Is your mind set? Do you believe it? Get your mind set! Is your mind set? Get your mind set! Is your mind set? Get your mind set! Is your mindset? Do you believe it?